I’ve never been a big salad eater…lettuce with a little dressing just seems kind of blah to me. Well, my mind has been changed…or maybe I should say my taste buds have reconsidered. 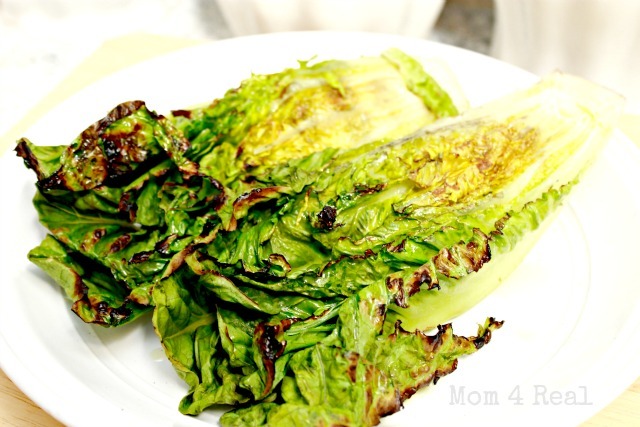 A few months ago, a friend had us over for dinner, and served grilled romaine salad before dinner. My husband and I looked at each other like she had lost her mind, but it was surprisingly one of the yummiest things I have ever eaten! 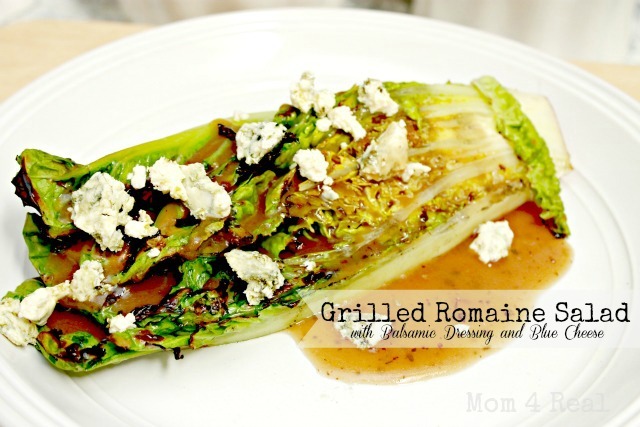 Now every time I see grilled romaine on a menu at a restaurant, I order it. I decided that with summer coming, it’s time for me to lose a few pounds, so I wanted to try to make it myself at home. It turned out perfectly!!! 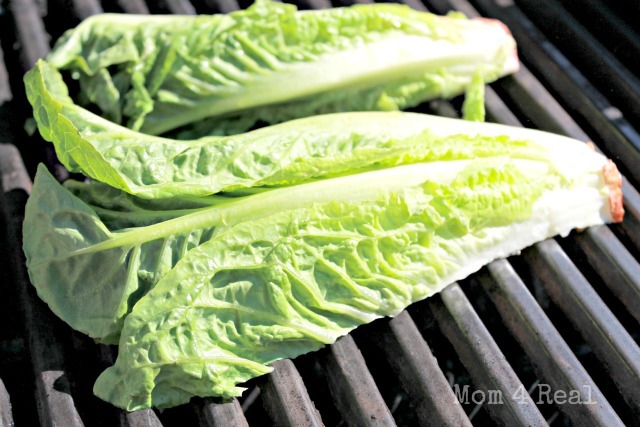 So, today, I am going to share my super easy, absolutely delicious grilled romaine salad recipe with you! You will need a head of romaine lettuce for two salads. 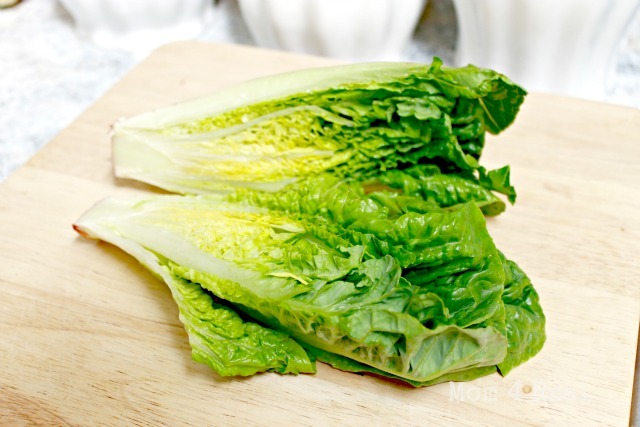 Wash your lettuce first, then cut your head of romaine in half, lengthwise. Drizzle olive oil on the inside of the lettuce, coating pretty well. Grill face down on medium heat for about 3-4 minutes. This is what your lettuce will look like…slightly charred and crisp. 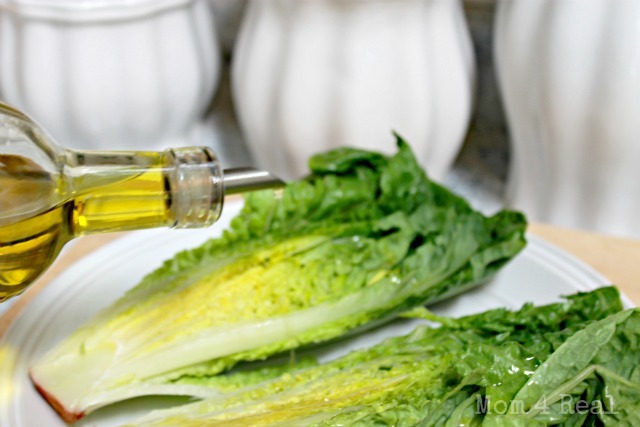 It changes the taste of the lettuce a bit…now your romaine will have a nice nutty flavor. 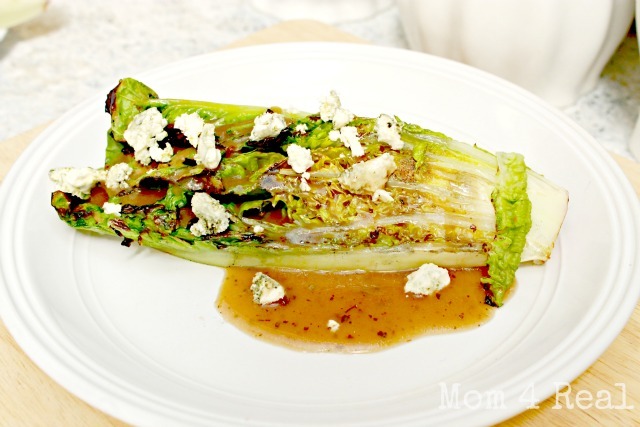 Now drizzle your grilled romaine with your favorite dressing and the toppings of your choice. I prefer balsamic dressing with blue cheese crumbles and sometimes crumbled bacon pieces. Eat it alone or pair it with your favorite pasta dish. Our family enjoys it with my cajun chicken pasta! Do you have any interesting salad recipes that you want to share? Leave them in the comments below! That looks so delicious! I love salads but never thought about grilling the lettuce first. I’m definitely making this! Your cajun chicken pasta looks good too. Would you please share the recipe? Thanks! Um. Yum. Drooling..gots to try this! 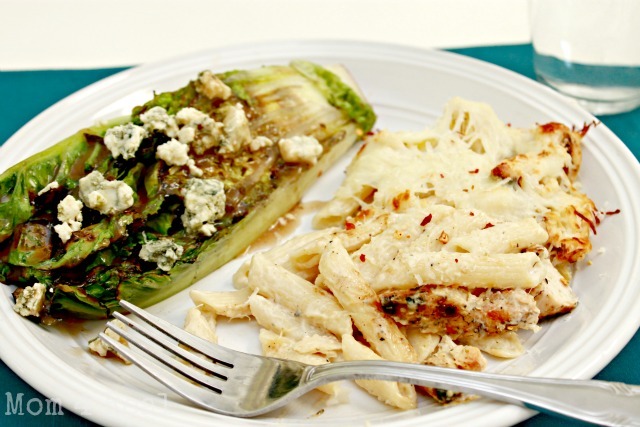 my husband loves making grilled salads, we first had this at a restaurant and now do it at home. Such a yummy summertime treat. I was just saying I wanted to grill more veggies – this looks amazing (and of course bacon on top can’t hurt)!! That looks so good! I’ve had something like this at a restaurant once and loved it. I wondered if it was easy enough for me to handle. ;) Thanks for the recipe. Oh my goodness that looks so fabulous! I will definitely be trying this one. Thanks so much for sharing it! I am going to try your grilled salad recipe. It sounds delicious and healthy. I have a favorite salad recipe also. I buy the spiral noodles. Boil til tender and rinse in cold water till cooled Drain well and then I add all my favorite vegetables, such as Broccoli , Cauliflower, carrots. Green Onions Radish all chopped into bite sizes. Rinse and drain well with paper towel. Mix with pasta noodles. Sprinkle with salt and pepper if desired. I pour Italian dressing over and toss well. It is better when chilled a few hours. I love it!!! I was just telling my husband that you could grill lettuce and he thought it sounded strange. I tried it at a food tasting and I think it tastes great as well. I’ll be adding this to my pinterest recipe collection. Looks great! Will have to give it a try, thanks!